Welcome to my first post for Linnie Blooms. 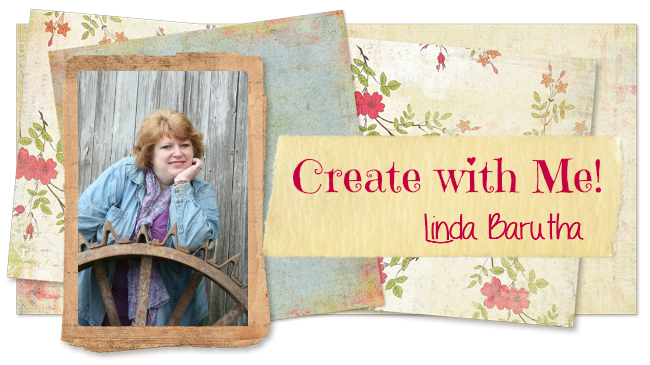 This past January I was introduced to Linnie Blooms at CHA(while doing a make & take) I went to Linda's booth to tell her I was in love with her style and products. My first project is with a hoop and I laughed- I always knew these from my mom's embroidery days, I never learned to thread a needle. (SMILE)I arrived at my project while standing on the Monorail ramp looking down into the submarine ride at Disneyland.. It begins with the oval kit 3x5 with cut to size canvas fabric, it has a natural base, which I sponged to a dark brown. I took from the "Flutter" mask/stencil (6pcs positive/negative) one of the pieces reminded me of a fish (my husband said owl) and the piece, that would be the owl's branch. I used scraps from misc scrapbook paper (Kaisercraft) and added them as mosaic style. The branch looked like coral to me and I painted it all over the canvas with a variety of product. I learned that these hoops make great shadow boxes and also are perfect for dioramas. so clever. makes me smile. DOODLED FLOWER GARLAND FOR SPRING!